The organizations that manage cultural sites such as museums and historical attractions have been facing challenges arising from reduced government funding, changes in the structure of leisure activities coupled with increased diversification in the leisure market, and new competition from the Internet. These challenges have resulted in an increased need to identify the socioeconomic and demographic characteristics of visitors to museums and historical sites in order to attract new audiences and inform decisions concerning public spending on culture. 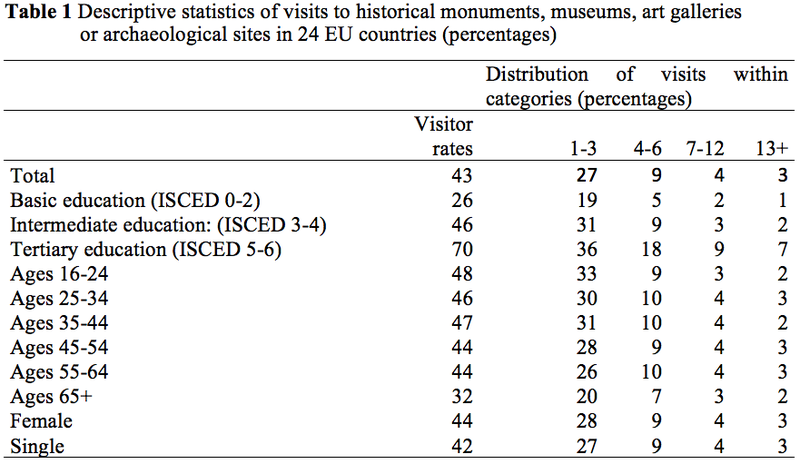 In Cultural Participation in Europe: Can We Identify Common Determinants?, we employ a cross-national comparative perspective to investigate the extent to which demographic and socioeconomic characteristics influence the decision to visit and the number of visits to museums, galleries, historical sites, and archaeological sites (henceforth “museums and historical sites”). Using EUROSTAT data, we compare the likelihood of visiting museums and historical sites (as well as number of visits), based on demographic characteristics (age, gender, country origin) and socioeconomic factors (education, income, labor market status, occupation) of approximately 350,000 respondents in 2006. Our first main conclusion is that level of education, per capita household income, higher-level occupations (e.g. professionals), and student status are the most important characteristics that determine the probability and number of visits. Furthermore, education is slightly more important than household income in increasing the likelihood and number of visits, meaning that human capital is more important than economic capital as a driver of cultural inequality. In other words, cultural stratification and inequality of access to cultural activities are mainly a result of attained status. These findings are important for two reasons. First, they provide revealing evidence of similar cross-national conditions that influence cultural participation, which can inform theories of cultural capital and stratification. Second our finding on the greater importance of human over economic capital is significant because it provides information for cultural and arts managers, urban planners, and museum and tourism marketing research – that is, those aiming to encourage disadvantaged groups to participate in the arts. For private museums and art galleries, meanwhile, knowledge of their visitors’ characteristics is of great value in shaping promotions and pricing. Our second main conclusion is that after accounting for socioeconomic and demographic conditions, there are still large differences in the probability of museum and historical site visits across countries. In particular, this probability is highest in the Scandinavian countries and in the UK, and lowest in southern Europe; the other large EU countries (Germany, France, the Netherlands, and Spain) are in the middle group. One possible explanation of these findings has to do with national differences in cultural policies and government financing meant to encourage visits to museums and historical sites. Lack of comparable data prevents from ascertaining direct links between cultural policy and cultural participation. Nevertheless, the conclusions we draw from our analysis represent a significant step forward in the discussion of these issues because we show that even after accounting for individual differences, there is still a great deal of variation among the EU countries and the corresponding antecedents merit further exploration. Our third main conclusion is that in addition to income and education, gender and age also affect cultural participation, though these effects vary widely across EU countries. On the other hand, the influence of education and income remains high across countries, if somewhat smaller in the Scandinavian countries. This finding challenges the assumption that in countries with generous cultural policies, education and income should have less of an effect on cultural participation. Our findings indicate that this is not the case, and that the impact of both educational and economic conditions is only somewhat smaller in the Scandinavian countries. This result means that even in the context of very different policies, there is no attenuation of inequality. In summary, this research demonstrates that it is possible to compare EU countries to estimate the relationship between socioeconomic and demographic variables and a composite measure of cultural participation. Overall, human capital resources (education) are somewhat more important than economic resources (income) in shaping the probability and frequency of cultural participation. There is no significant indication that countries with different cultural policies are able to attenuate the effect of education and income on cultural participation. Falk, Martin, and Tally Katz-Gerro. 2015. “Cultural Participation in Europe: Can We Identify Common Determinants?” Journal of Cultural Economics DOI: 10.1007/s10824-015-9242-9. Martin Falk is Senior Economist at the Austrian Institute of Economic Research (WIFO). Tally Katz-Gerro is Associate Professor at the Department of Sociology and Anthropology at the University of Haifa and Docent at the Department of Economic Sociology at the University of Turku. Pinacoteque. Art gallery in Paris closed in 2016 due to decreased visitors. Creative Commons 3.0 license. Source: Wikimedia Commons. One factor, certainly for the UK, is the importance of parents taking their children to museums, heritage sites etc. This instills a sense of habitual activity. Note parents more so than teachers. Thank you for this comment Steve Green. Intergenerational transmission of attitudes toward culture, appreciation of cultural sites, and norms of behavior at cultural sites are very central in forming patterns of cultural participation. While school arts programs and extra curricular activities are also important, the continuous effect of the home environment is more dominant at an early age.